UTRGV Xavier McDaniel Jr., and Greg Bowie tie up UC Irvine Brandon Smith during the 1st half of a play at UTRGV Fieldhouse on Saturday Dec.9,2017, in Edinburg. 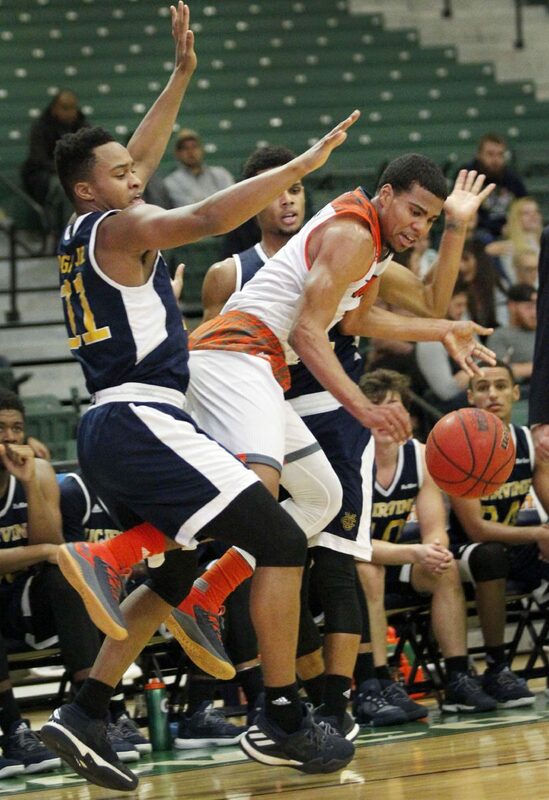 EDINBURG — After UTRGV used its pressing, attacking style to erase a double-digit deficit, one of UC Irvine’s guards delivered a very honest message to Vaqueros senior Nick Dixon. UTRGV’s full-court press forced a season-high 24 turnovers on Saturday, turning an 11-point halftime deficit into a 73-59 win against UC Irvine at the UTRGV Fieldhouse. The Vaqueros closed the game on a 31-7 run during the final 8:54, holding UC Irvine to 0-for-8 shooting with six turnovers during the stretch. 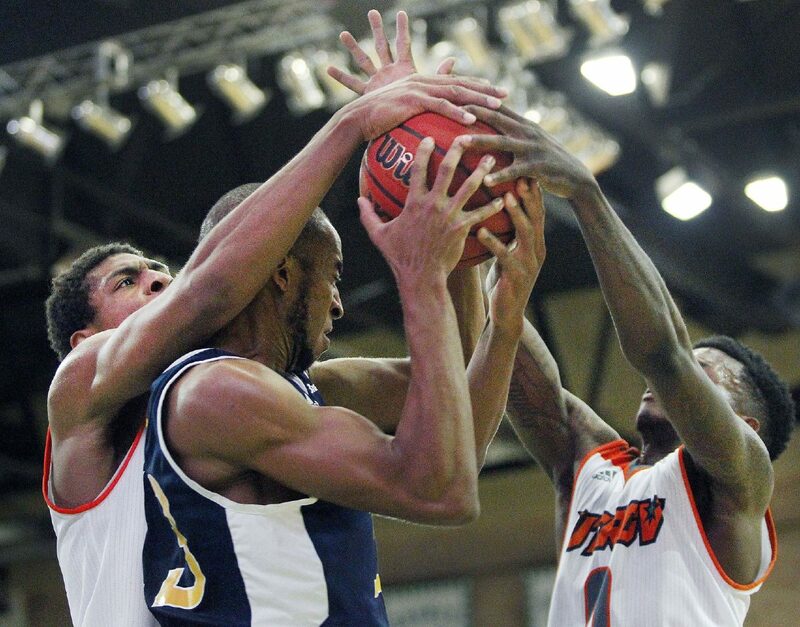 UTRGV Moe McDonald applies pressure on UC Irvine Tommy Rutherford during the 1st half of a play at UTRGV Fieldhouse on Saturday Dec.9,2017, in Edinburg. UTRGV Nick Dixon is double teamed by UC Irvine John Edgar Jr and Evan Leonard during the 1st half of a play at UTRGV Fieldhouse on Saturday Dec.9,2017, in Edinburg. UTRGV Nick Dixon drives on a UC Irvine defender during the 1st half of a play at UTRGV Fieldhouse on Saturday Dec.9,2017, in Edinburg. 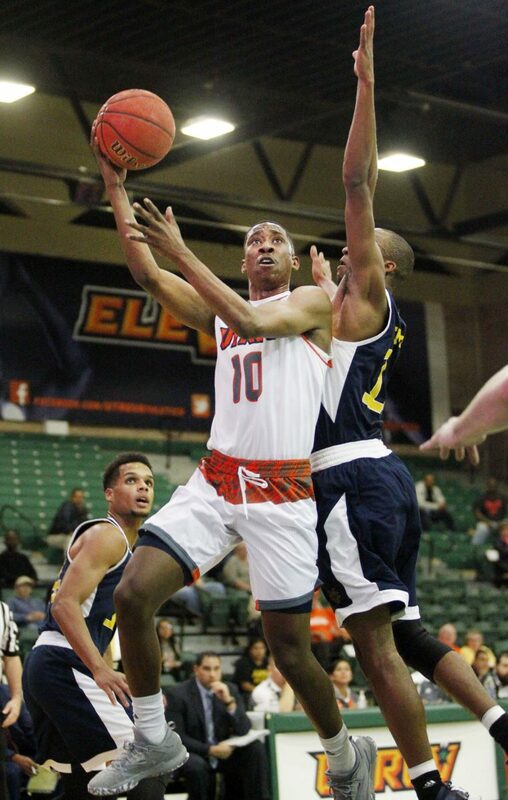 UTRGV Moe McDonald looks to score against UC Irvine John Edgar Jr.,during the 1st half of a play at UTRGV Fieldhouse on Saturday Dec.9,2017, in Edinburg. UTRGV’s second-half turnaround was especially pronounced on the interior. During the first half, Irvine outrebounded UTRGV 27-11 and scored 20 points in the paint compared to UTRGV’s four. In the second half, UTRGV won the rebounding margin 20-16 and scored 16 points in the paint against Irvine’s two. Kimasa said the points of emphasis were rebounding and pounding the ball inside, and Dixon said the players were told to focus on their defensive rotations and avoid unnecessary fouls. Whatever the cause, UTRGV outscored Irvine 46-21 during the second half. UTRGV’s shooting percentage improved from 30.0 percent during the first 20 minutes to 50.0 percent during the final 20, while Irvine’s numbers plummeted from 54.8 percent in the first half to 22.7 percent in the second. That gritty nature translated to the Vaqueros attacking the basket more regularly. UTRGV attempted 12 3-pointers in the first half compared to just five in the second. 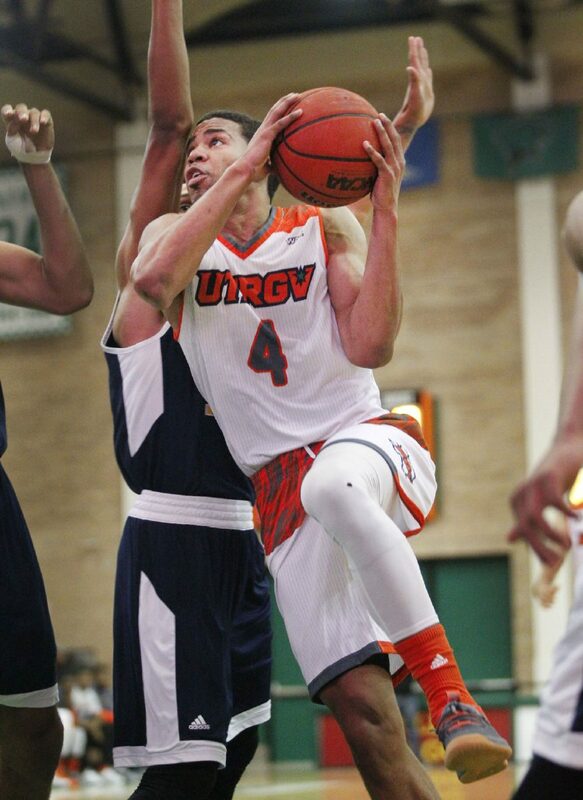 Nick Dixon led UTRGV with 23 points on 7-of-13 shooting. He got off to a slow start on Friday, twice fumbling the ball out of bounds for turnovers. During a timeout, Hill had a few words with Dixon on the sideline. 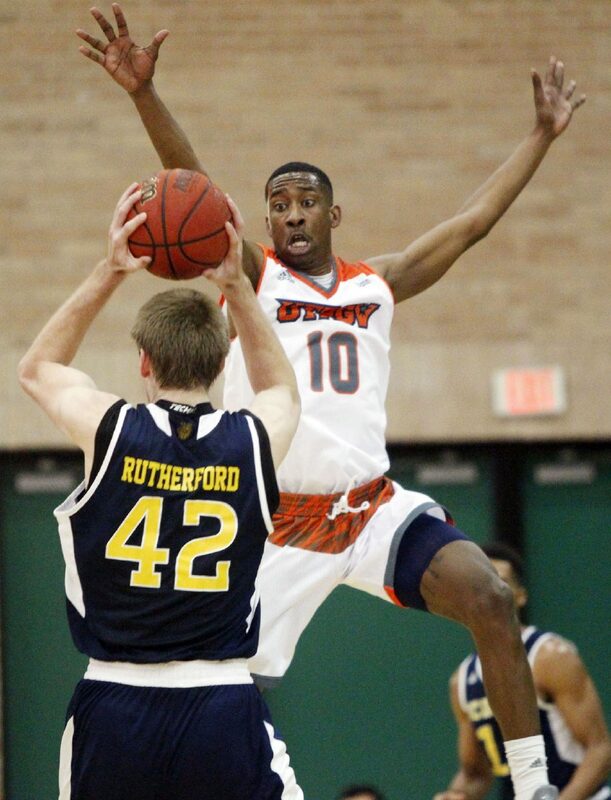 Dixon has more than doubled the point total of UTRGV’s next-leading scorer this year, so Irvine tried to neutralize him with a box-and-one defense. Dixon said it was the first time UTRGV had seen that look this year, but Irvine didn’t stay in it for long. Dan Kimasa scored 12 points on 4-of-6 shooting, while Xavier McDaniel Jr., Lesley Varner Jr. and Johnny Crnogorac each scored eight. Guard Javon Levi set career highs with seven assists and six rebounds, leading the team in rebounding despite being the shortest player on the roster at 5-foot-10. UTRGV finished with a season-high 12 steals. Dixon had four, Varner had four, and Greg Bowie had three.